← Three tips for choosing cabinet hardware! We welcome Joseph Freenor, blogger at CFT 411 who was so kind to share this article he wrote on Top Knobs. Joe is a writer and woodworker and for those of us in social media – he is one of the original bloggers who first entered the scene and informed us on the kitchen and bath industry. You can find his wonderful blog at http://cft411.com/. Whether one works as a woodworker or an interior designer, every part of design is a challenge, up to and including the hardware for furniture or cabinetry. From the outside looking in, it’s nothing more than a knob or hinge, and one will do the job just as well as another. And in the strictest, most utilitarian sense, this is certainly true. But that said, there is a world of difference between the plain knob that enables one to open a cabinet door, and a knob that adorns the piece. And even that, the word “adorns” can, if it is not used correctly do more to damage the look of a piece than to help it. When I took woodworking classes at Palomar College we studied hardware, but the entire focus was on the more arcane aspects of it: how many threads to an inch does a certain bolt have-that sort of thing. Even now, my eyes glaze over at the memory of that particular class, but as it is with any discipline, there is a certain bo dy of information one must simply have is if one is to succeed at it. But to return this to our current discussion, I’m not sure that there is anywhere a class in what makes this particular knob a good choice for a cabinet and this other a poor choice. I think about all a body can do, really, is to find one of the better makers of hardware, examine their output, and choose whatever seems to look best of on the piece itself. And it is important, too, that the hardware itself be made well, because even though it’s “just a knob,” if made on the cheap, it will tend to cheapen the piece on which it resides. And with that, I can introduce the subject of today’s blog, because Top Knobs is certainly one of the finer makers of hardware. 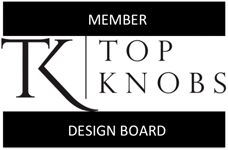 Top Knobs was founded in 1994 and has already risen to the number one manufacturer of decorative hardware for the professional market. In part this is because of their innovative designs, because that is what the end consumer sees. But, really, there is more to their success than t hat. I cannot prove that my aesthetic sense is better than yours, because that sort of thing is largely an intangible. What works for you may not work for me, and vice versa, but that doesn’t make it wrong-or right-for either of us; it just makes it different. On the other hand, we can definitely speak to the quality with which a product is made, because those items that are cheap tend to be made cheaply. The thrill of the low price quickly dissipates when we see what that cheapness has produced in the way of quality control, if a lack of same can be characterized as quality control. And that brings us back to Top Knobs because they have gone at this quality thing with a passion. Top Knobs has wonderful features like pins that prevent knobs from turning, no sharp edges or open backs, and SOLID knobs and pulls, which effects both durability and ease of installation. Cheaper hollow hardware means that the longevity of t he knob is lessened, simply because there tends to be fewer threads holding the knob in place, and that, in turn, makes it more prone to stripping out. Top Knobs’ solid products are inspected before shipping to ensure burr-free screw holes and consistent center-to-center hole dimensions for predictable, fast and attractive installation. Finally, as Top Knobs points out, the people who take shortcuts with the manufacturing of the knob are likely to take shortcuts on the finish, which means fewer coats of protective lacquer, less polishing, and more vulnerability to tarnishing. Brass knobs are gorgeous, but who wants to polish them every couple of weeks? What difference does all of this quality control make? Well, for those who depend on good hardware for part of their living, a lot, but also, I think, a lot for the consumer. Any new knob will shine, but for how long? All that glitters is not gold.